This entry was posted on Wednesday, October 24th, 2007 at 10:30 pm and is filed under Knitting, Scarf, WIP, Yarn. You can follow any responses to this entry through the RSS 2.0 feed. Both comments and pings are currently closed. 3 Responses to Tubey…what a wonderful design! ahh you have inspired me to look at tubey again and it seems like a great possiblility for some yarn I just bought! Keeping my fingers croosed for the vintage stole pattern too, it’s sooo pretty. You inspired me to make a double Dayflower scarf too, it’s almost ready…. 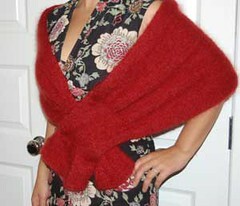 I’m planning on knitting a Tubey and while looking for inspiration found your lovely version. Your stocking stitch body looks much better than the original rib – especially with the clever shaping. Any chance that you could post a completed picture and some detail of how you modified the body to get such a great fit?